While powder rooms serve an important purpose—particularly for guests—small square footage and awkward layouts can present some design challenges. Looking to give your half bath some personality? One of our favorite ways to transform a tiny space is with wallpaper. 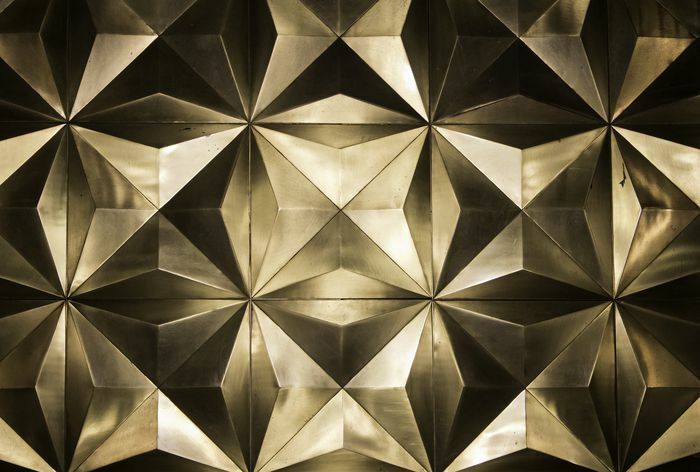 A feature wall is guaranteed to make a statement. When it comes to accessories, consider a chandelier for major impact. And a mirror makes even the smallest space look larger. Planning a powder room revamp? Before you get started, check out these stylish and totally functional bathrooms, sure to inspire your own space. Designed by Mark D. Sikes and Michael Griffin, this restroom recalls the magic of the Mediterranean. The blue-and-white tile backsplash and sandy flooring evoke visions of the sea as it washes over the shore, while a Byzantine-inspired mirror and classic white pedestal sink enhance the aesthetic. There’s no shortage of fun in Michelle Gage’s Havertown, Pennsylvania home—and her half bath is certainly no exception. A round brass mirror and faucet complement the fanciful flamingo wallpaper. Rich, refined and oh so luxe. Navy blue walls and mosaic tile anchor this Miami commode by Nicole White Designs. A gold-accented undermount sink, marble countertops, and a crystal chandelier add a major dose of glamour. Modern meets rustic in Hudson Valley, New York. Foz Design utilizes natural materials to transform the washroom into a relaxing retreat. Wood floors and locally quarried stone nod to the scenic surroundings, while a floating vanity and Sputnik chandelier complement the home’s contemporary architectural style. In a restroom rut? Add some whimsy with Scalamandré zebra-print wallpaper. Designer Katie Rosenfeld chooses the denim colorway for this Wellesley, Massachusetts home. (The famed motif also comes in Serengeti green, safari brown and masai red—which you may have seen in Wes Anderson’s 2001 film The Royal Tenenbaums.) A gold bamboo mirror rounds out the well-traveled vibe. 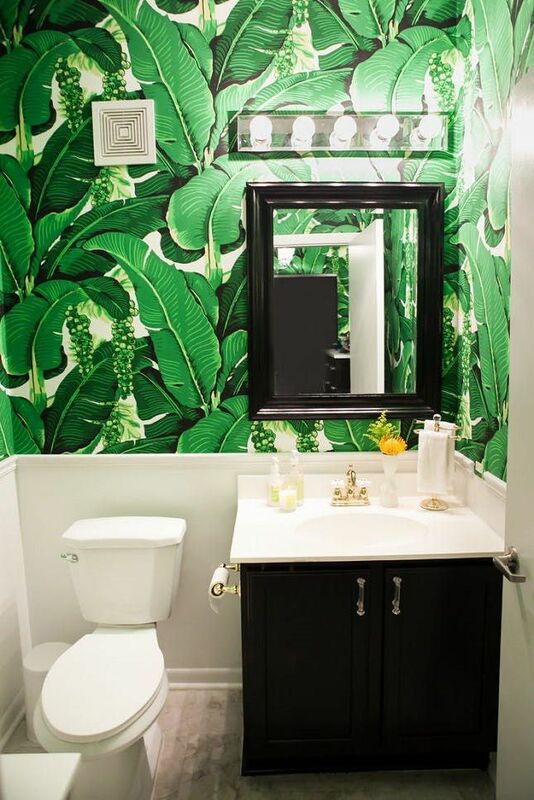 Take some inspiration from Amelia Canham Eaton and transform a run-of-the-mill restroom into a tropical oasis with banana leaf wallpaper. Guaranteed that anytime you (or your guests) enter this space, you’ll be transported to paradise. Proof that monochromatic doesn’t mean boring. In fact, it can be one of the most daring design choices. 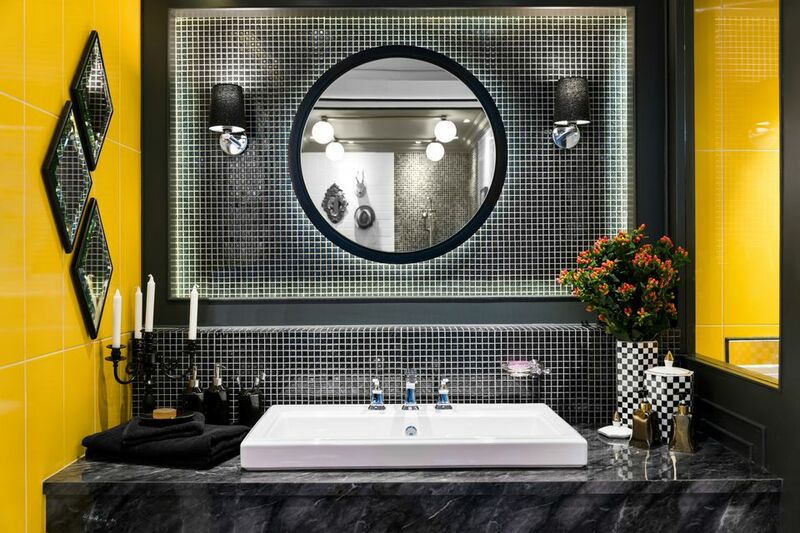 And if executed properly—as is the case with this vibrant powder room—it can be one of the most breathtaking. The deep periwinkle hue, coupled with Moroccan-inspired accents—mosaic tile, rustic tin lanterns, and a carved wooden mirror—exude exotic allure. Who says you can’t use a big, bold pattern in a small space? Not Jacquelyn Clark! She believes the most interesting designs often break conventional rules—and we totally agree! This washroom is a prime example. There’s no denying that the damask wallpaper is the star. Everything else is white—save the blue floor and a few cheerful yellow accessories—so the walls really shine. There is perhaps no combination so chic as black and white. Need further evidence? Just look at this bathroom by Ali Budd Interiors. Schumacher Queen of Spain wallpaper—with its painterly, mid-century charisma—is paired with polished nickel fixtures, a marble countertop, and a beveled edge mirror. The result is a look that’s at once totally timeless and completely modern. Love the look of wallpaper, but can’t commit? Consider a faux finish. This DIY stencil technique by Mandi Johnson, via A Beautiful Mess, is great for ambivalent homeowners as well as renters. Added bonus: It only costs a few dollars. All you need are stencil supplies and a quart of paint. Just because you’re landlocked doesn't mean you can’t incorporate some coastal charm into your abode. This beachy bath by AT6 Architecture, celebrates the sea with a cool color palette and ocean-inspired accents—including teal tile, a rope-hung mirror, and a mermaid wall illustration.